When Landmark Construction President, Joe Bittaker wants to say thank to his employees, tradesman and others involved in a project, he barbeques. “I am a Georgia boy, and nothing says thank you like cooking for people,” said Bittaker. Bittaker is known for his expertise at the grill and often cooks at education, community and sporting events that the company sponsors as well employee appreciation events. If you like to work hard and play hard in a collaborative environment where you contributions are noticed and rewarded, Landmark Construction is seeking to add more adventure seekers to the team. The office is conveniently located near Sacramento, so staff can easily enjoy sailing in the San Francisco Bay, rock climbing in the Sierra Nevada mountains and cycling in the Gold Country foothills. 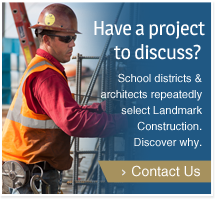 To learn more about employment opportunities with Landmark Construction, go to the Construction Jobs page.